One of the coolest aspects of the BOYC Convention was the wide range of workshops that were offered. I have attended stand-alone workshops before, but the convention was unusual in the sheer number that were offered. 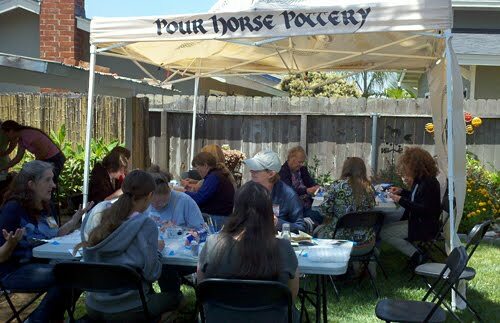 Pretty much every aspect of producing ceramic horses was covered, so that attendees could sample what was involved with each step. These first two pictures were taken during the Custom Glazing Workshop, which was held on Thursday at Pour Horse Pottery. Participants were given their choice of either an Animal Artistry Dartmoor or Friesian Mare. They masked the markings and patterns, and selected the color for Joan and Addi to airbrush. After that the horse was returned to them for detailing. 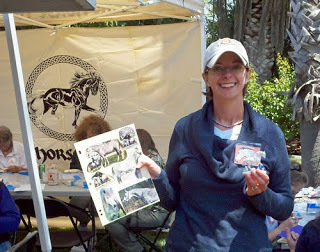 Here is my roommate Katie Gehrt with the Dartmoor that she was glazing dapple grey. Joan airbrushed the basic color and Katie erased the dapples and painted the details. All the horses were fired and ready to take home on the last day of the show. Joan even supplied boxes and packing material, as well as offering to ship the horses home for anyone that could not carry them. Talk about full service. That was a workshop for underglazing, which is the method I use to glaze my own work. The other method is china painting, which is completely foreign to me. For that reason I was really looking forward to taking the workshop on China Painting with Karen Gerhardt. I will post about that separately in the future, because it really deserves a separate post. But the coolest set of workshops, in my opinion, were done as a pair. On Friday Kelly Savage gave a workshop on sculpting a simple medallion. Throughout the show on Saturday, a small group of folks worked on their medallions. 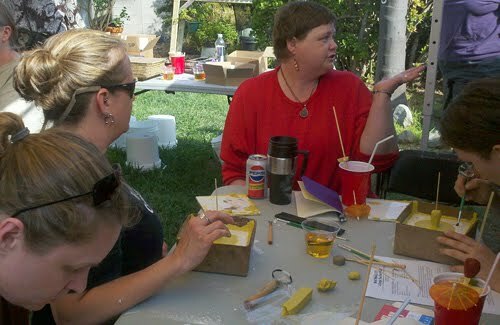 That was because on Sunday, Margaret Olson of MAO Ceramics gave a workshop on simple moldmaking. 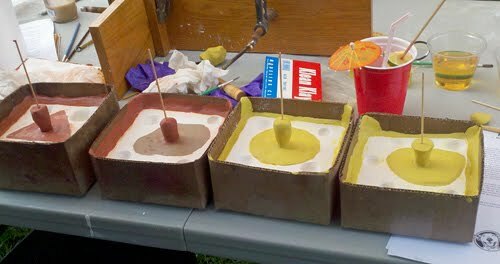 Here are some of the participants making plaster waste molds of their medallions. This full slate of workshops was the part of BOYCC that had me most intrigued when Joanie first explained the concept. 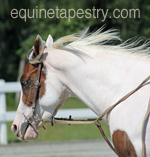 As is probably apparent to anyone who has followed this blog for any length of time, sharing techniques is really important to me, and I would love to see this kind of concept take off within the model horse community. Blog posts and articles can convey a lot of information, but there is nothing like handling the materials in person alongside someone who already knows how to use them. It is certainly true of ceramics, but I also think the same kind of format would work well for the other artisan activities like sculpting, casting, prepping and painting. 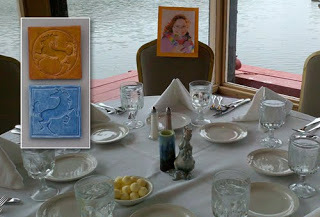 Sarah Minkiewicz-Breunig’s table, with an inset photo of the two of the magnets she gave to each of her guests. I have always thought that the equine collectibles community should tinker with the format of our shows, and I’ve tried to support those shows that did. Bring Out Your Chinas has always been a trendsetter when it came to specialty shows catering to ceramic collectors, but this year was something else entirely. Joan and Addi envisioned something entirely different in concept as well as format; a true convention experience. Because there were so many innovative things about the weekend, I wanted to highlight them in separate posts. One of the most unusual things about BOYCC compared to other shows was that meals were part of the event. Breakfast, lunch and dinner were provided to the participants for each day of the event. Usually these were held at the host resort, in restaurant that looked over the lake. The windows in the picture above show the view we had of the water. It was a lovely setting with abundant natural light for viewing the pieces on display. On Saturday there was a Banquet Dinner where awards were given for the previous day’s competition. It was a great way to truly appreciate the horses and owners, rather than just catching snippets of the announcements while actively showing or judging. The other unusual aspect of the Banquet was that we were arranged at Artist Tables. Artists who worked in ceramic were invited to host a table. 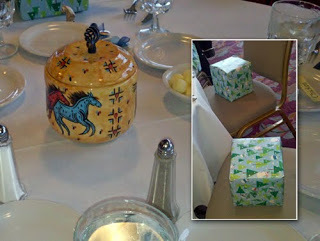 This involved creating a centerpiece that would then be taken home by one of the guests. It was open-ended, with no real requirement about what could be done. I must confess that I came up blank on ideas when I was approached, and suspected that I’d be kept too busy with the name tags to do the idea justice, so I declined to take a table. It was a wise choice, because I would have felt quite the slacker compared to the efforts the artists gave their tables! The top picture is of Sarah Minkiewicz-Breunig’s table. The creation of her centerpiece was detailed on her blog. Entrants were asked for table choices, but I didn’t have a preference. I figured I would spend most of dinner fretting about my presentation (which followed immediately afterwards), so my only request was that I be seated with fun people. The room was full of those, so I couldn’t go wrong no matter where I was, but Sarah’s was my assigned table. This one was from Joan Berkwitz of Pour Horse Pottery. That is an Otto that has been turned into a tea pot. He has a wrapped wire handle and a lid cut into his back, as well as a pour spout through his mouth. A Collier has been turned into a creamer, and a Limerick into a sugar bowl. 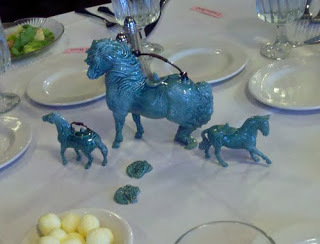 Joan’s guests received Pour Horse pins glazed to match the tea set. This was the table beside me, and probably my favorite. It was for Karen Gerhardt of Wizard’s Vale Arts. 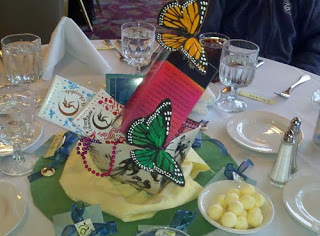 Karen went all out with a claybody custom Boreas as her centerpiece. Each of her guests received a smaller Boreas that had been art glazed (each a different color). 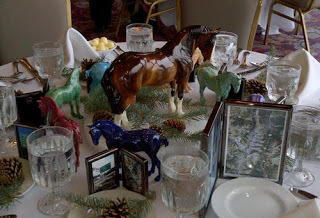 I loved that Karen brought a bit of her home in Colorado to her table, with evergreen bows, pine cones and photos of the mountains. 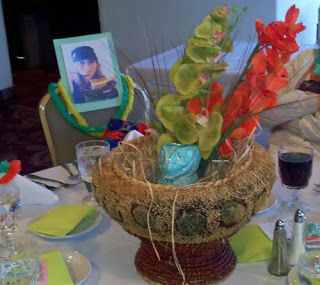 Kristina Lucas-Francis had a table done like a Tiki Bar, complete with a Tiki Rex in an aqua green glaze. (For those more familiar with her work on horses, Kristina also sculpts dinosaurs.) 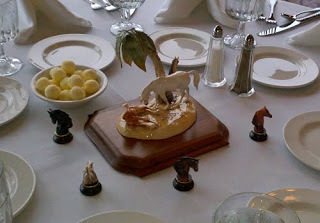 Her guests each received a glazed Bucky pins that matched the Tiki Rex. This was the table for Marge Para of ReMuda Pottery. Marge handbuilt the pot that was her centerpiece, but in each chair was a gift box that contained a different hand-thrown pot. They made me wish I had taken the wheel throwing class offered at the local clay shop earlier this year. Of all the concepts that Joan talked about while the convention was in its planning stage, this one – artist tables – was the one that gave me pause. Ours is a community with conflicted feelings about the celebrity of its artists, and I worried that dedicating tables to individuals might be awkward. Oddly enough, the tables did not focus attention on the artists, but rather allowed the artists to focus on their customers. Perhaps it was the format of the artist as “host” and the collectors as “guests”, and the gifts for each person there. It seemed much more like an appreciation of those who allow us to do what we love, rather than a recognition of some kind of status.